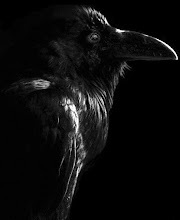 Nevermore: Break Bread to the beat of U2! You know how when you are wandering around and minding your own business, you occasionally come across something both benign and innocent, that for some reason, makes you laugh like a mentally deficient village idiot for about five minutes? Complete with stolen sellotape and all, go me. Why did I find this so funny? Just - just - look at it! U2 aren't particularly holy now, are they? Not only have they gotton into severe trouble before where drug abuse is concerned, but they represent and hail from one of the least religiously stable countries in the world. Is it a metaphor? Do they actually break bread, while listening to U2, or is it just a figure of speech? I just find the image of a load of Christians 'breaking bread' while listening to U2 and generally being all holy amusing to no end. 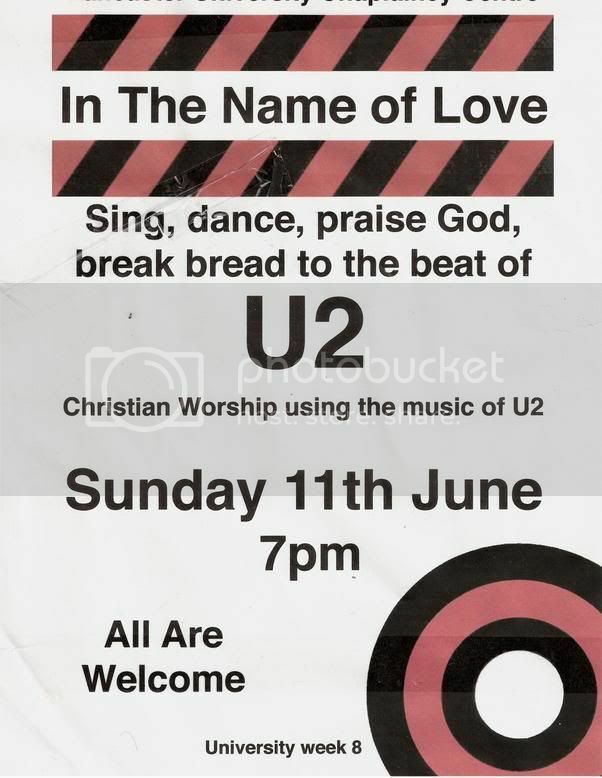 'Christian worship to the beat of U2'...oh I really want to see that. If I was sad/frightening/a stalker, I'd go and spy on them. I wish I had an invisibility cloak like in Harry Potter. I'd crash the place and start making things float. Make the bread dance to the beat of U2, and the like. But I don't have an invisibility cloak. So in reality, I'd probably just spy on them from the roof and end up falling through the skylight, like they do on TV. I don't think they have skylights. But they do in my head. I met the Christian group once. That was interesting. My anti Christian status, makes it more so. It was the first week here, and I was quite lost. I knew I was close to where I had to be, just not there yet. I asked a group of friendly looking people for directions. They asked me to follow them, and led me down a corridor. Poor, simple me, assumed that they were showing me where I needed to go. It was when they led me into a room filled with lots of other people, and a large table with a buffet on it, that I began to get suspicious. It was then when I noticed that all the people were wearing black shirts with BIG YELLOW CROSSES on them, that it all clicked in my little head. I had been mobbed by the Christian society. They asked if I would have lunch with them and talk about their faith...at this point, I was backpedalling towards the door rather fast. I muttered something about having somewhere to be, and scarpered. And that was my first and last experience with the Christian group.